A new report commissioned by Eploy, in association with HR & Recruitment Grapevine, has revealed some interesting findings for how candidates are sourced by sector and how successful sourcing channels are in generating the right quantity and quality of candidates. Sourcing channels analysed include Company Website/Careers Site, Professional Social Networks, Generalist Job Boards, Specialist Job Boards, Employee Referrals, CV Databases, Social Media, Employee Referrals, Print and ATS/CRM. Both in-house and agency recruiters were asked to rate each of the sourcing channels they use on a regular basis for the quantity of candidates they generate and the quality of candidates they provide. These responses were then analysed and presented visually in a quadrant by sector to illustrate the results. An example of this is shown here. The midpoint of the quadrants would indicate a marketing channel that is producing sufficient numbers of candidates of average quality. 1. Scarcity of qualified candidates is still the #1 challenge for recruiters. Although down from last year (70%), 62% of in-house recruiters report the lack of suitably qualified, skilled or experienced candidates is still their biggest issue. 2. There is a squeeze on recruitment marketing budgets. In the hospitality, leisure and tourism industry – as well as the government, not-for-profit and charity sectors, a lack of recruitment marketing budget is forcing in-house recruiters to do ‘more with less’ – 36% of in-house recruiting teams cited this as an issue. 3. Recruitment content marketing drives careers site improvements. Companies with an active recruitment content marketing strategy also have the best performing careers sites. The more content they publish, the higher the quantity and quality of candidate applications they receive. 4. You can’t improve what you can’t measure. Only a third of in-house recruiters regularly measure the effectiveness of their sourcing channels. But those that do see significantly improved returns across every sourcing channel except for job boards. 5. Health and social care in talent attraction crisis? The health and social care sector is struggling to find the right mix of talent across all sourcing channels. Candidate scarcity is a huge issue affecting 78% of recruitment teams in this sector. This sector also can’t rely on professional social networks to identify suitable talent. 6. Only 50% of in-house recruiters market to their existing candidate database. We found that only half of in-house recruitment teams can match new jobs with candidates they already have in their talent CRM or ATS. Agencies rank their candidate database as the number one source for both quality and quantity – it’s the #1 source for 94% of agencies. 7. Social Media continues to disappoint, but Professional Social Networks excel. As with the 2016 survey, Social Media consistently lags behind in candidate attraction despite being used by 64% of in-house recruiters and 67% of agencies, while professional social networks like LinkedIn perform well in many sectors and industries. 8. Job Boards providing uncertain results. 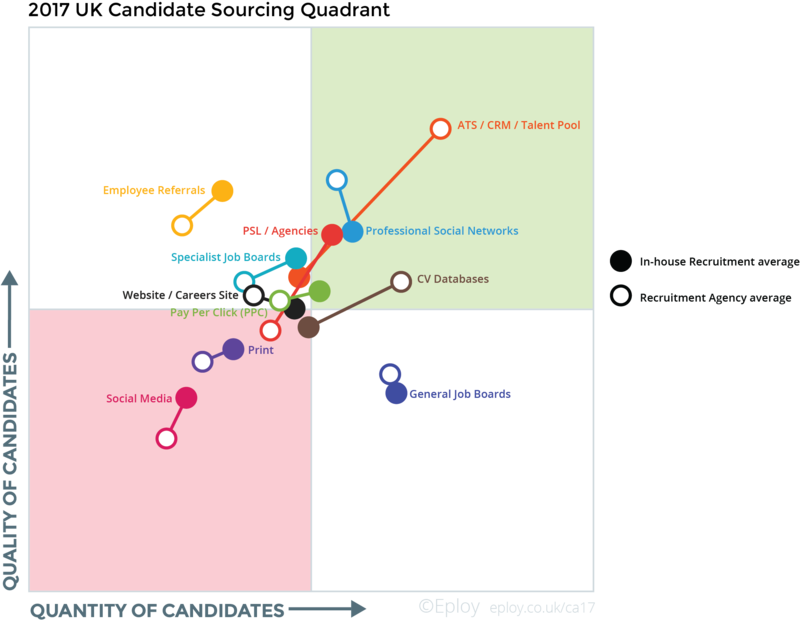 While both generalist and specialist job boards are regularly used for sourcing candidates, results are mixed. And while specialist boards rank high for candidate quality recruiters who regularly measure their performance report the reality is somewhat less impressive. 9. Employee Referrals generate the greatest candidate quality. Once again employee referrals are ranked number one for candidate quality, with 70% of in-house teams having an active referral programme, but this comes at the expense of quantity – even for the largest organisations. 10. Company Careers Sites improve with scale. Still the most utilised sourcing channel, used by 94% of in-house recruiters, posting jobs to your company website or dedicated careers site alone can’t be relied upon to generate the levels of candidates required – except for larger organisations. The full report shows some interesting results across industries/company size and provides actionable insight for recruiters on both sides of the recruiting fence. You can download your free copy of the Candidate Attraction Report 2017 and examine each channel based on company size and industry sector on the link below.